Jupiter transit to Libra 2017 prediction for Cancer Sign - Guru peyarchi palangal 2017 for Kataka Rasi as per Thirukanitha Panchangam. In 2017 Jupiter transit to Libra sign would happen on September 2nd, 2017 and stay there until October 4th, 2018. Let us analyze Guru Peyarchi 2017 prediction in detail for Kataka Rasi, so we can know what to expect. Astrologically, Cancer is the fourth house in the Zodiac Sign. The stars Punarpoosha (4th pada), Poosam and Ayilyam come under the Cancer constellation. The people born under any of these three stars have Cancer as their moon sign. Lord Jupiter is the Ruler of your 6th and 9th House. He is a giver of both good and bad, on your moon sign. Last year, Lord Jupiter had transited to Virgo Sign (a friendly House for you) on August 2nd, 2016 and stayed there. This year, Lord Jupiter will transit to the House of Libra on September 2, 2017, and stay there until October 4, 2018. Let us look at the outcomes of Lord Jupiter for last year. Students were unable to get their desired marks. Your career prospects were stagnant. Your marital life was full of small problems between you and your spouse. This affected your mental peace and affected your work quality. After all these effects, the transit of Lord Jupiter must bring cheers to you. Let us now look at the changes and prospects that this year’s transition of Lord Jupiter will bring to you. Generally, Lord Jupiter now transits to your 4th House, which is the House of health and maternal side. Though this transition brings in more expenses, it will be all for celebratory occasions. From Libra sign, Jupiter aspects 8th, 10th, and 12th houses for Cancer sign. 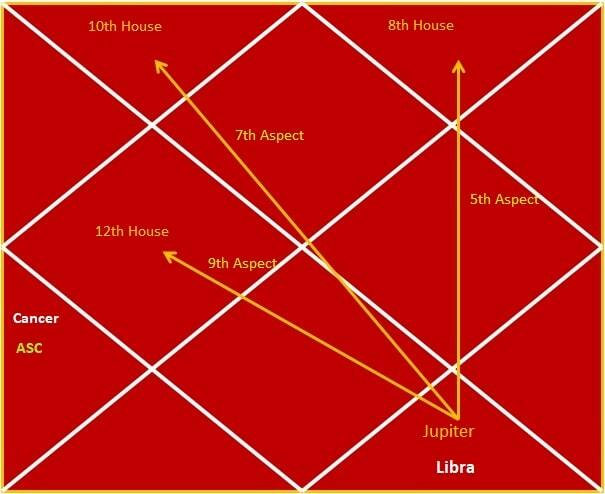 Lord Jupiter aspects on House of Aquarius (your 8th House) which is called Ashtama Sthanam. The 8th House is the House of longevity. Hence, your health will improve and whatever troubles afflicting your life span will vanish away. From the House of Libra, Lord Jupiter aspects your 10th House (the House of Aries). The 10th House deals with career. So, your career will take off with flying colors. Your plans for a new venture will work out successfully. You will invest in stocks, bonds, land, and property with your well-made money. Lord Jupiter aspects your 12th House (the House of Expenditure, House of Gemini) which is called Vraya Sthanam. This will bring in more expenses, but you need not worry, as all these expenses will be of a positive nature. Some students will change their schools or colleges this year. Your studies will not be affected. You will incur costs due to buying property, building houses, shops, repairing your house, buying new vehicles, changing your vehicle and other such positive changes. Some might even have to change everything from their phones to laptops. Some of your mothers might have a hospital visit in the near future. Your expenditures will keep piling at the door of your income. Some of you might have to visit a doctor to check up on your health. Those awaiting marriages will get married. Marital life will be good. Your health will be better. Your career will improve. Though this Jupiter transit brings with it much expenditure, those are all for good causes, bringing you cheer.